In an evil time, Noah stood out. Especially when God gave him the job of warning—and preparing to save—the world. Are things much different in our world today? Noah and his floating zoo have captured the imaginations of artists, writers and even moviemakers. Land animals and human beings were saved from extinction because Noah pleased God. But what led to the Flood? Why was the world in such a sad state? Why did God pick Noah to build the ark? And why does God say the world today is like the time of Noah? When God created the animals and humans, He said it was all very good. But it wasn’t long before Satan tricked Eve and Adam into doing what God warned them not to do. God told them how to live happy, meaningful lives, but they believed Satan’s lies instead. They disobeyed God and chose to decide for themselves what they thought was right and wrong. But God is the only One who really can decide what is good and evil. Still, Adam and Eve and their family insisted on choosing for themselves, and they began choosing evil more and more often. By the time of Noah, God saw violence and corruption everywhere. And people were always thinking and planning more evil. God looked down and said, “I am sorry that I have made them” (Genesis 6:7). Instead of letting the evil and the suffering get worse and worse, God decided to wipe it all out and start over again. But there was one bright spot. “But Noah found grace in the eyes of the LORD” (verse 8). He “walked with God,” which means Noah agreed with God and acted the way God acts (verse 9). Because Noah obeyed God, God knew He could trust Noah to do a vitally important job. God told Noah how bad things had become on earth. He told him that He planned to send a flood to cleanse the earth of its evil. And God gave him a massive building project: to make a huge boxlike boat to allow living things to escape the Flood. God gave Noah exact measurements and instructions for making the ark. 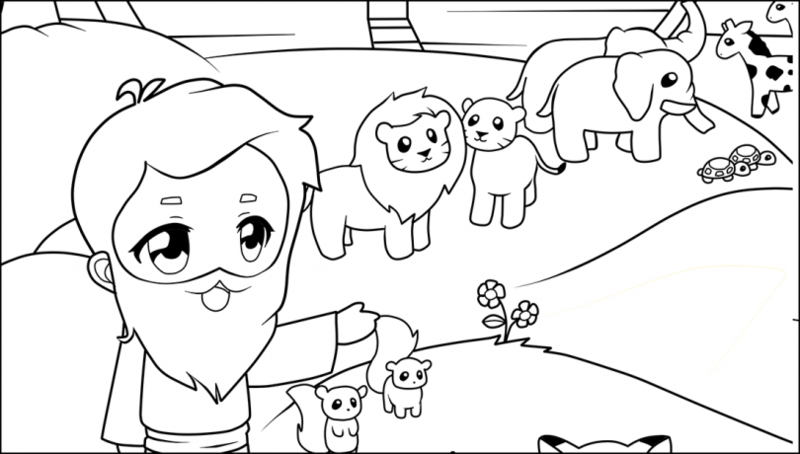 He also told Noah to gather all kinds of food for his family and for all the animals. “Thus Noah did; according to all that God commanded him, so he did” (verse 22). We don’t know where Noah built the ark, but it probably wasn’t near an ocean. Likely his neighbors and visitors thought he was very strange. They may have made fun of him, and clearly none of them listened to his warnings. Sadly, no one but his own family was found “worthy to escape” this forerunner of the end-time judgment (Luke 21:34-36). The people ignored Noah’s preaching. They didn’t believe a flood would come, and they didn’t want to change their ways. It was much like today! As Jesus Christ explained, “For as in the days before the flood, they were eating and drinking, marrying and giving in marriage, until the day that Noah entered the ark, and did not know until the flood came and took them all away, so also will the coming of the Son of Man be” (Matthew 24:38-39). When their work was finished, God told Noah and his family to get on the ark. God also gathered the animals and sent them onto the ark two by two. God saved a male and a female of each kind of unclean animal (the animals that God tells us not to eat). He saved seven (or seven pairs) of each kind of clean animal (the ones that God tells us we can eat in Leviticus 11). When all the animals needed to start over again were on the ark, God shut them in. Still, the only people on the ark were the eight members of Noah’s family. For the first seven days on the ark, nothing happened. But on the seventh day waters from underground poured out and heavy rain began. And it rained for 40 days and 40 nights. The water rose above the mountains, and all air-breathing land animals outside the ark died. For more than a year, Noah, his wife, his three sons and their wives cared for the animals on the ark. Finally, God told Noah and his family and the animals to leave the ark and to “be fruitful and multiply on the earth” (Genesis 8:17). God blessed Noah’s family and the animals as they made a fresh start on the earth. Noah continued to obey God and encouraged his family to obey. Noah was thankful to God for protecting them from the Flood, and he offered sacrifices to honor God. God was pleased with Noah. He promised to never again send a flood to destroy the earth, and He set His rainbow in the sky as a reminder of this promise. But God knew sin and evil would return, and He especially warned about the return of the violence that had led to the Flood. He said: “Whoever sheds man’s blood, by man his blood shall be shed; for in the image of God He made man” (Genesis 9:6). The last part of that verse was a reminder of the amazing plan God has for us. He made us like Him, and He wants us to become His children (1 John 3:1-2)! But humanity has come full circle, and the world is again evil and violent, like it was before the Flood. How can we be like Noah? How can we help to save our world from total destruction? As Jesus said, “But as the days of Noah were, so also will the coming of the Son of Man be” (Matthew 24:37). Jesus called Himself the Son of Man, and the coming He talked about was His promised second coming. Earlier He said He would come back just in time to save humans from killing ourselves (verses 21-22). In today’s evil world, God is still looking for people like Noah. He wants to find people who love Him and walk with Him. He is looking for people who try to please Him and obey Him—people He can trust to do the jobs He has for them. How can we be like Noah? How can we help to save our world from total destruction? First we need to change and become like God. Our free booklets God’s 10 Commandments and Change Your Life! tell more about what God is looking for. And our booklet The Mystery of the Kingdom describes the wonderful new world God has planned to replace this evil one. It also tells more about how we can fulfill God’s purpose for us to become His very children! We encourage you to download these free booklets today.